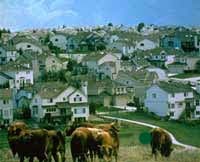 Suburban sprawl laps at the American landscape like wildfire, consuming over two million acres of land each year. SUBDIVIDE AND CONQUER shows how sprawl impacts peoples' lives in cities, suburbs and towns, and what some people are doing to change the way we grow. As Americans, we share the myth of the Rocky Mountain West as a majestic place of high-noon deserts and John Wayne mesas, river valleys ringed by saw-toothed peaks, cabins and cowboys. But the reality of the modern West is one of look-alike stripmalls, snarled traffic, air pollution, and ranches sold for subdivisions. Like most places in America, this is a region under siege by unplanned low-density development -- sprawl. The West is now the fastest growing and most urbanized region in the country; most of this growth is occurring on the fringes of metropolitan areas and in rural communities. In some areas, land is consumed for subdivisions at the dizzying rate of over an acre an hour. Narrated by Dennis Weaver, SUBDIVIDE AND CONQUER explores the consequences of sprawl, the history of this automobile-centered pattern of development, and notions about the endless frontier and rugged individualism. The film also suggests remedies, and takes us to places where sound public policy and good land use planning have stemmed the tide of sprawl. We learn that, when given a choice, many Americans want to live in distinct, well-designed neighborhoods, with all the amenities and attractions that they provide, and they want driving to be one among numerous transit options rather than a lifestyle requirement. The film takes us through the West - to Montana, Colorado, New Mexico, Arizona, Utah and Oregon - to tell the story of what is in fact a national issue making front-page news in every region of the country. "For its first-rate script and score, great production values, and useful suggestions, I highly recommend that you 'head this one up and move it on out' to your video shelves." "More than merely showing the contradictions of the American Dream in its simultaneous romanticization and destruction of nature, Subdivide and Conquer provides a multidimensional critique and various alternatives to one of the greatest environmental problems facing the U.S. today." "An excellent introduction to the social, political and environmental problems of urban sprawl...Excellently suited for junior or senior level classes in environmental studies at the high school level, or college level classes in modern history, environmental studies, urban studies, interdisciplinary classes that include the above topics." "An entertaining and informative look at the forces that drive development and lead to urban sprawl...Though SUBDIVIDE AND CONQUER maintains a regional focus, the process described in this program applies to the country as a whole." "A well-planned, carefully developed discussion of a problem which plagues many areas of our country far beyond the mountain West...recommended." "Every viewer of Subdivide and Conquer is bound to learn something new and important...it offers its analysis in a lively and informative manner." "Opposing business-as-usual practices with optimistic possibilities, this video effectively champions planned development in the West."